Dilan Mataraarachchi walked into the lab “301.2” located in the Grove School of Engineering at City College of New York. He grabbed a pair of goggles and headed to the cabinets where the ChemE car is stored. He took out a big, heavy purple box and revealed the plexiglass crafted ChemE car called Iodonator c8. Dilan, 28, is a chemical engineering major and the Captain of the ChemE Car team. 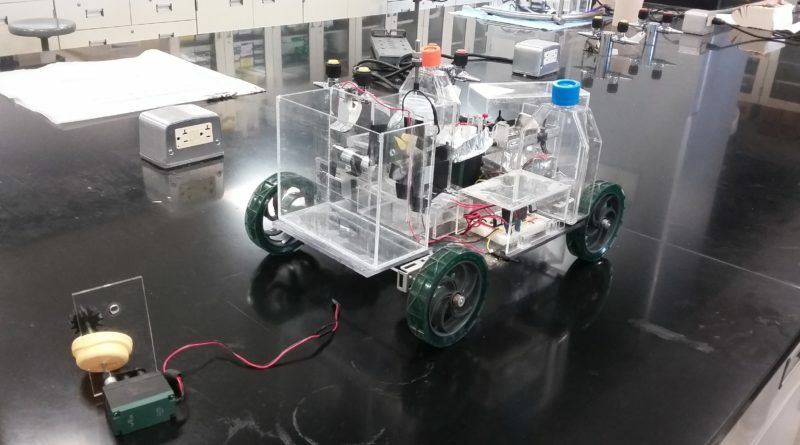 “The ChemE car is something in which we can use our knowledge in physics, organic chemistry, and reactions engineering which is also called kinetics,” said Dilan. Iodonator c8 is a shoe box size car that is powered by a chemical reaction. It doesn’t use any type of brakes, computer programming, or electrical circuits to be stopped. The Iodonator c8 was built from scratch by the ChemE Car team. The car’s battery was built by Dilan in the CUNY Energy Institute located in the Grove School of Engineering of CCNY. After the car was done, the ChemE Car team used hydrogen peroxide and ascorbic acid to make chemical reactions. The team’s goal is to win the National ChemE Car Competition taking place in San Francisco in November. The team is trying to get enough funds to go to California. They created a GoFundMe page for the ChemE car. Iodonator c8 won first place at the Mid-Atlantic Regional Competition in Delaware in April. CCNY has been participating in the competition since 2013 and that was the first time that CCNY won first place at the regionals. Two years ago, Kavindra Singh, the captain of the ChemE car at that time, did a presentation of the car during a thermo-dynamic class Dilan was taking. “At that moment I thought, ‘wow he has to design something that runs with a chemical reaction which is related to chemical engineering.’ So, that was the start,” said Dilan. 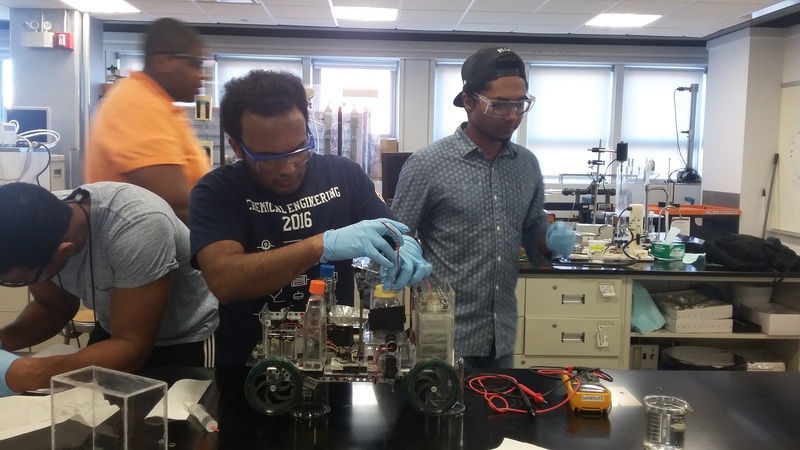 “I give him the full credit for our victory in the regionals, he is highly motivated,” said Aftab Siddiqui, 26, Senior Chemical Engineering major and member of the ChemE car team. Shakir Julien, 21, a Chemical Engineering major, mixed the solutions in a balance that made the solutions move in a circular motion, while Olivier Pierre, 23, member of the ChemE car, transcribed the data. Dilan started working on the ChemE car just as a team member and now is managing the development of the team’s chemical achievements. This year, the ChemE car team made substantial changes to the car as mandated by the rules and regulations of the competition. There will be a panel of judges to verify whether the car participating in the competition is not the same car used for the last competition, or if the team used something not approved by the rules and regulations. Once Dilan became the captain of the ChemE car team, he divided his team members into groups. They had meetings once a week to discuss the ideas for this year’s car. “Working in the ChemE car is a good opportunity for whoever is going to work as a captain to show leadership,” said Dilan. He said that the main thing he learned from his team members is how to get the work done together as a team. His time as captain of the ChemE car team will end in December, but he plans on working in a power plant after graduation because he wants to work doing chemical reactions.